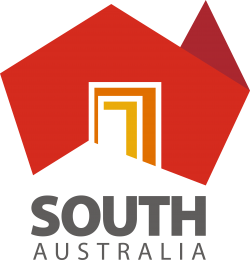 Welcome to the second instalment of the Flinders ArchSoc blogging project, ‘From the Dig It Archives’! In this edition, we have two articles reproduced from Issue 2, 1997. In ‘Message from the Chair’ (1997:2) President Matthew Rice calls Flinders Archaeology Society members to action – to volunteer for an exhibition at the Union Gallery; a trend we continue, as we recently called current members to action to volunteer at the ‘Archaeology Revealed’ event for About Time: South Australia’s History Festival. In the second article ‘Report on the magnetometer survey of shipwrecks on Younghusband Peninsula in Coorong National Park, South Australia’, Timothy Anson describes an effort by the Society to use identify the locations of historic shipwrecks in Coorong National Park. Read below for a detailed outline of the project which attempted to discover the locations of several vessels, which included Adelaide (1849-1874), Margit (1891-1911), Sophia Jane (1840-1844), Mariner (1839-1845) and Fanny (1838-1838) (Anson 1997:3-4). Rice, M. 1997 Message from the Chair. Dig It: Newsletter of the Flinders Archaeological Society 2:2. Anson, T. 1997 Report on the magnetometer survey of shipwrecks on Younghusband Peninsula in Coorong National Park, South Australia. Dig It: Newsletter of the Flinders Archaeological Society 2:3-4. The holidays are over and it’s time to get back to our usual diligent routines and that includes the Archaeology Society. The survivors of the Coorong Trip are now ready to grapple with the challenge of the Union Gallery Exhibition. Eager Beavers are still needed, check pages 19 & 20 for rosters and available times, and DON’T FORGET TO PUT YOUR NAME DOWN AS A VOLUNTEER. Also up and coming is the Annual Archaeology Society Dinner, all current members are invited to join this gluttonous fest. The Annual Australian Archaeological Association Conference is yet another event we intend to send delegates to, so for those interested get in early for a good seat in the bus. Finally, we would like to thank all of those members who have generously given their time and efforts to the many Society activities that we have been involved in so far this year. Report on the magnetometer survey of shipwrecks on Younghusband Peninsula in Coorong National Park, South Australia. During the period of 07/07/97 to 11/07/97 an attempt was made by members of the Flinders University Archaeology Society (FUAS) to identify the precise locations of a number of historic shipwrecks believed to be lying under the sands on the seaward side of Younghusband Peninsula. Clark (1990) provides details of a number of sailing vessels which came to grief along the peninsula but whose exact current locations (if any) are unknown. Vessels targeted by the investigation included Adelaide (1849-1874), Margit (1891-1911), Sophia Jane (1840-1844), Mariner (1839-1845) and Fanny (1838-1838) (figure 1). Figure 1. 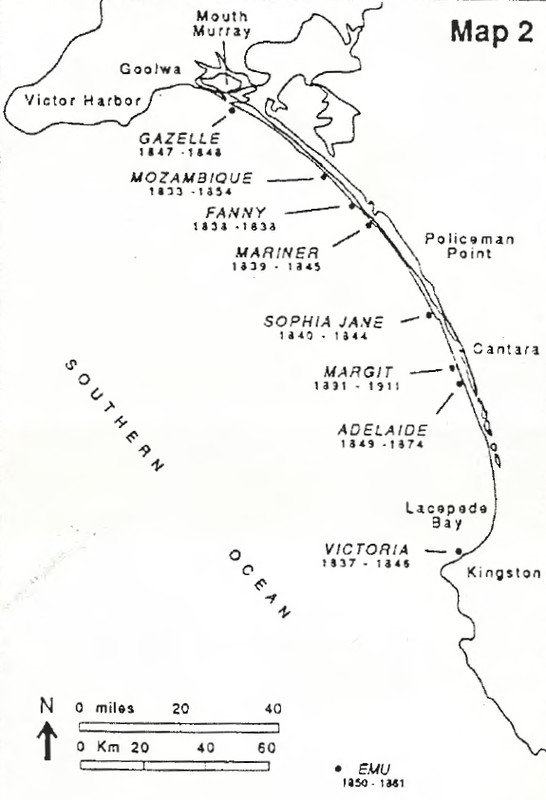 Map showing approximate shipwreck locations along Younghusband Peninsula, South Australia. The research design was based on one proposed by Mr Bob Ramsay. Using a four-whell drive (4WD) vehicle, a magnetometer was to be towed along the beach between the low water mark and front sand dune line. It was anticipated that this method would identify areas of significant magnetic anomaly which could correspond with the shipwreck material including anchors and other large metallic ship fittings. Once an anomaly had been identified its precise location would be recorded using non-differential global positioning system (GPS) technology. In addition to the magnetometer survey field-walks were carried out to try to visually identify shipwreck locations. In groups of 4-5 people members of FUAS searched (emu parade style) along the beach from the seaward side of the front dune system and the secondary dune system. Due to gar failure (an unknown malfunction in the magnetometer), the magnetometer survey was cut short after only two kilometres of survey. No anomalies were therefore identified using this method. Two more field-walk surveys were carried out at locations to the north of Forty-Two Mile Crossing (between 12km and 7km north of Forty-Two Mile Crossing). These surveys covered up to ten kilometres of beach but failed to locate any sites of relevance to this investigation. Although this exercise was relatively unsuccessful in the pursuit of its prime objective it served as reconnaissance for a more detailed investigation to be held at a later date. A combination of gear-failure, poor weather conditions and poor track conditions severely restricted the scope of the exercise. For example, the only access, a 4WD track which followed the back of the beach, became virtually impassable at a point approximately 27km to the north of Forty-Two Mile Crossing. This therefore restricted access to a stretch of the peninsula where, according to Clark (1990; figure 1), several shipwrecks rest in close proximity to each other. The approximate locations of the Mozambique, Fanny and Mariner are within a 20km stretch over 40km to the north of Forty-Two Mile Crossing. Similar conditions were experienced to the south of Forty-Two Mile Crossing. The following recommendations are offered for any future research of this nature. Firstly, that research be conducted in summer months when track conditions improve due to greater traffic levels. This would allow access to the northern most extent of the peninsula. Secondly, that a backup facility or technician be on hand to deal with equipment failure (i.e.. the magnetometer). Thirdly, that all vehicles be provided with the necessary equipment for travel in isolated and sandy environments, including portable air compressors, heavy duty jacks and winch. On a positive note, a precise location was given for the wreck of the Margit, information which was not previously available. Field-walk surveys proved to be effective and worthy of future implementation. Finally, Flinders University archaeology students and staff were provided invaluable field experience both generally and specifically with regards to the unique Coorong environment. Clark, P. 1990 Shipwreck sites in the south-east of South Australia1838-1915. Australian Institute for Maritime Archaeology, Special Publication No. 5 SA Department of Environment and Planning. Look out for the next edition of ‘From the Dig It Archives’ on Wednesday the 15th of May!